1995 was the year that Sweden and Denmark became more linked than they’ve ever been, thanks to the completion of the Oresund Bridge. To be honest, the building of the bridge was a pretty big deal. The time it would now take to travel from Copenhagen to Sweden by train was only about 40 minutes. In addition, people could easily flow between the two countries for work and Swedes had much easier access to Denmark’s Kastrup airport. All in all, it was a pretty groundbreaking infrastructure project. Travelling across the bridge is pretty cool the first few times; part of the bridge runs above water whilst the other half is submerged in a tunnel that starts on a man-made island. I mean, a man-made island is kinda cool, no? So why am I telling you guys about this? Well, I don’t know about you but I have pretty limited holidays every year. Something I’ve found myself doing more recently is combine multiple cities on each holiday. There are just too many places I want to see and too little time. I’m also sure no one’s missed that Copenhagen is becoming an incredibly popular weekend destination. In turn, the beauty of this bridge is that you could easily add a day trip to Sweden to your itinerary. Two countries, one holiday! Hello, you multi-tasking you. After moving abroad in 2009 I’ve crossed this bridge more times than I care to count, both by car and train and between multiple destinations. The amount of confused train travellers I’ve encountered during those years is also staggering. As an example, last time I crossed the bridge I helped no less than 3 people buy tickets. 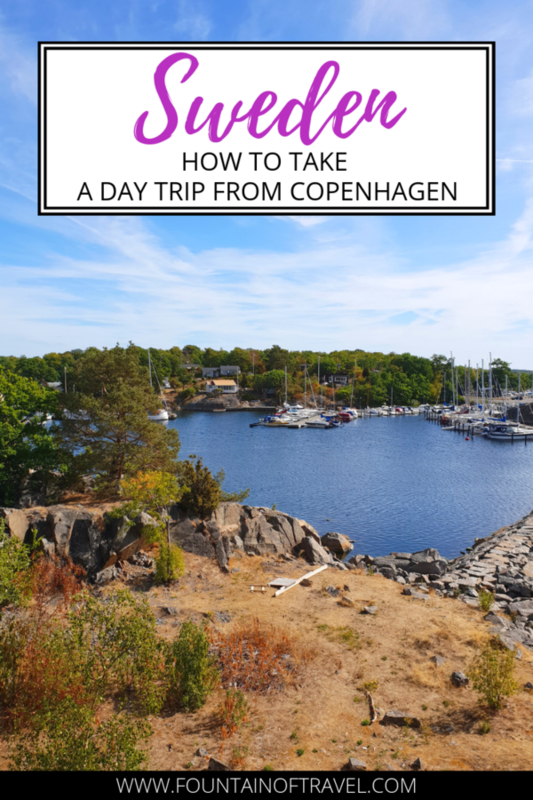 So to make your crossing as easy as possible, I’ve compiled this super easy guide to train travel from Copenhagen to Sweden. You’ll most likely travel from either Copenhagen main train station or Copenhagen airport. The ticket machines for Swedish trains are actually a bit tricky to find at the main station if you enter from the wrong side. Walk into the train station from Bernstorffsgade (opposite the amusement park Tivoli). You’ll walk through the first set of doors and the machines are on your right hand side before you walk through the second set of doors. There’s only two machines so keep your eyes open. The second possible departure station is Copenhagen Kastrup Airport. Trains for Sweden depart from Terminal 3. When you exit arrivals, keep walking straight ahead past the crowds waiting for passengers. The terminal is shaped like a rectangle and you have just entered the short end of one side. You want to make your way to the glass structure in the middle of the terminal. You’ll notice loads of train ticket machines on the right hand side and a long queue for a ticket office. These are NOT what you want. Instead, you want the tiny machines just behind the glass structure. There’s about 5-6 machines and generally the queues are much, much shorter. Trains always leave from platform 1, which is next to the ticket machines. There are two entrances on opposite sides of the terminal but they lead to the same track. I have a pretty sad confession. I’m literally writing this post from memory because I’ve used the ticket machines so many times. And I thought Netflix was my only obsession. Anyway, here’s your very simple step by step guide to buying train tickets from Copenhagen to Sweden. Change the language by pressing the little flag symbol. You can choose between two buttons; choose the one that says buy a ticket. Select ‘Across the Oresund Bridge’. There are a few different types of tickets. You can buy a youth ticket if you’re under 15. A Duo ticket can be used for up to 5 people with maximum 2 adults in the group (15+). If none of those apply, just select the amount of adult tickets you want by pressing the + button. Pay by credit or debit card. Instructions for card payment are shown on the card machine, rather than on the screen. Collect your ticket from the ticket flap at the bottom of the machine and KEEP HOLD OF IT. You cannot buy tickets on the train and could be fined for not having a ticket at inspection. Best case scenario; you’ll be thrown off the train. I have seen people get thrown off more than once so make sure you buy and keep hold of that ticket. The key website that you need to plan your day trip is Skanetrafiken (Skånetrafiken). You can find the website by clicking here. All you have to do is input your departure station and arrival station plus date and time. Easy peasy. Although most people associate a day trip from Copenhagen to Sweden with travelling to Malmo, there is so much more to Southern Sweden than just Malmo. I’ve suggested a few Swedish destinations below, so you can pick according to your interests. The train times are all from Copenhagen Central Station; the airport is closer to Sweden so times would be reduced. Turning Torso – keep an eye out for this turning skyscraper when you’re on the train across the bridge. Sit on the left side of the train for the best view. 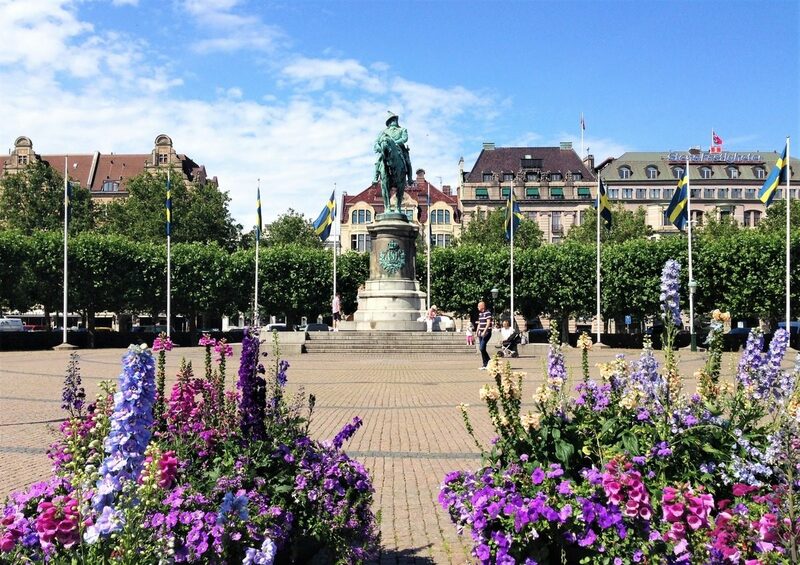 Stortorget – the first square you’ll encounter when you walk into the city centre. Malmö Choklad – part museum and part chocolate shop, Malmö Choklad is an ecological chocolate brand housed in a historic chocolate factory. You can go on a guided tour of the museum and also remember to buy the chocolate. This place is even better at Christmas! Lund is one of my favourite day trips from Copenhagen and perfect if you’re looking for a picturesque city experience. It’s believed that Lund was founded in 990 so you’re in for a pretty historic day. 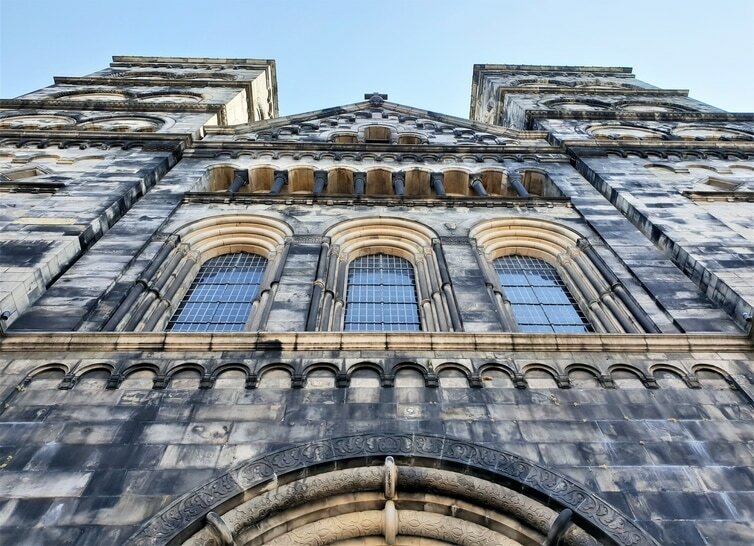 One of the oldest buildings is Lund Cathedral dating from the 12th century. Lund is also home to the oldest university in Sweden (which ranks in top lists worldwide) which was founded in 1666. So basically, if you like history and beautiful old buildings, Lund is the perfect day trip for you. It’s also really easy to travel to with trains departing every 20 minutes from Copenhagen to Lund. 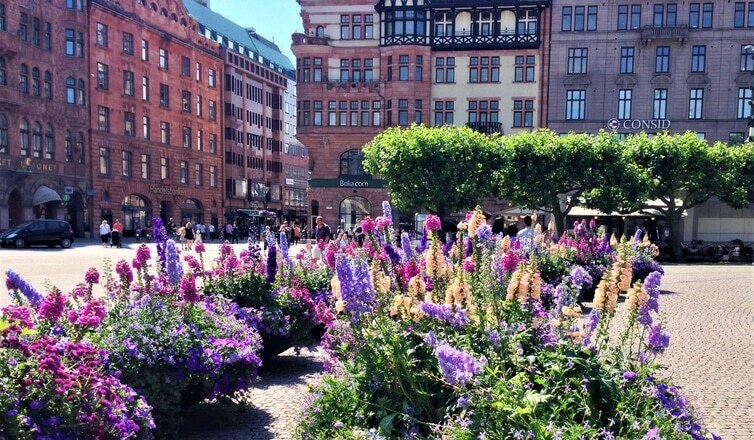 Travel through Malmö and then Lund will be your next stop. Lund Botanical Garden – beautiful gardens, especially the greenhouse complex. A must-visit. 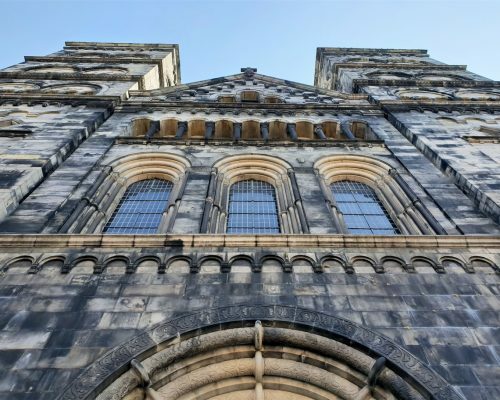 Lund Cathedral – another must-see when in Lund. Entrance is free and make sure you don’t miss the astronomical clock on your left as you enter. Lund Market Hall (Saluhallen) – the market hall has some great food places for lunch. Both Malmo and Lund are in Scania, which is becoming a pretty famous county (even Vogue has written an article about it). To the east of Scania, however, is the county Blekinge. Blekinge is the smallest county on the mainland and is, in my humble and very biased opinion, incredibly underrated. Blekinge is perfect if you want to spend the day in towns surrounded by the sea. To travel from Copenhagen to Blekinge, you need to get a train bound for Karlshamn/Karlskrona. These train sets usually split up at the second last stop in Scania (Kristianstad). Make sure that you are at the back of the train, as only the last train set will continue into Blekinge. 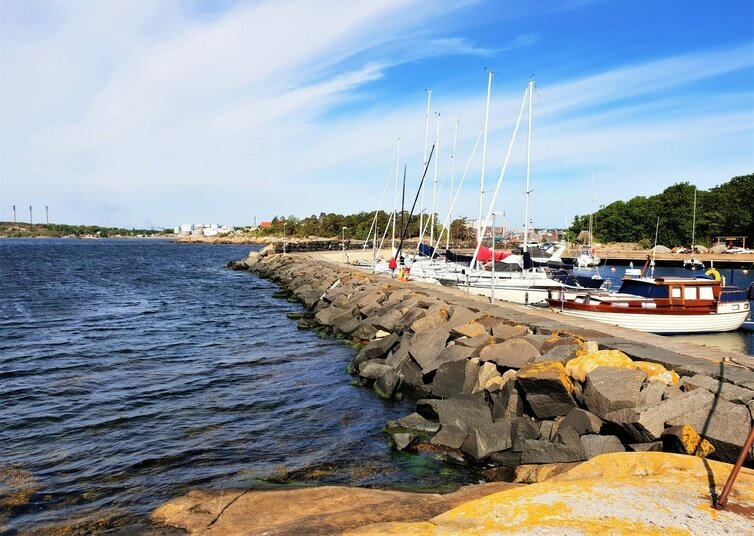 Vägga – situated in Karlshamn, Vägga is a gorgeous stretch of land by the seafront. The best thing you can do is go for a walk along the cliffs and then have lunch at Wägga Fisk och Delikatessrökeri. They serve fish dishes and are situated right on the edge of the sea so the views are right on point. They’re only open during summer and unfortunately only have a Swedish website, but at least you can drool over the pictures (link here). If you’re looking for local Swedish food, it doesn’t really get much better than this. Travel time is 2,5 hours plus 30 minutes walk from Karlshamn train station. Sölvesborg – whilst Sölvesborg itself is small, it hosts the famous Sweden Rock Festival every summer. This huge event attracts people from all over the world and headline acts have included everyone from Aerosmith to ZZ Top. If you want to explore Sölvesborg itself, it’s known for Sölvesborgsbron (the Solvesborg Bridge) and its town centre in shades of soft yellow, red and pink. Travel time is 2 hours 11 minutes. Hopefully you feel inspired to include a day trip to Sweden on your next Danish city break! Perhaps the most important tip of all is to bring your passport. A few years ago you could cross between the two countries without a passport but Swedish border police have become more stringent. Although they didn’t check mine this summer, I recommend that you bring your passport just to be on the safe side. Over to you! Have you ever considered a day trip to Southern Sweden? Like this post? Don’t forget to pin it for later! So cool that you can be in Sweden in less than an hour! Amazing! Can’t wait to go to Copenhagen and make it to Sweden too!